What Fish Are Okay to Eat? You are in Home > Blog > Food & Drinks > Which Fish Are Okay to Eat? Keeping up to date on the ingredients that are and are not sustainable is a full time job. As attitudes change and more data is collected about the affect our diets have on the planet, so do ideas surrounding what is good and bad to eat. The oceans and the fish we eat is an issue of major concern in Fine Dining with some of the world’s best chefs meeting just a few months ago to make a personal pledge to cook more smaller fish. The oceans could feed millions of people every day, if properly managed, but the problem is that we overfish certain species, under fish others and use many of the fish we do catch for feeding other animals, not ourselves. With the rules about fishing and the guidance given as to what fish are good to eat changing almost weekly, it’s hard to keep up with the latest information. 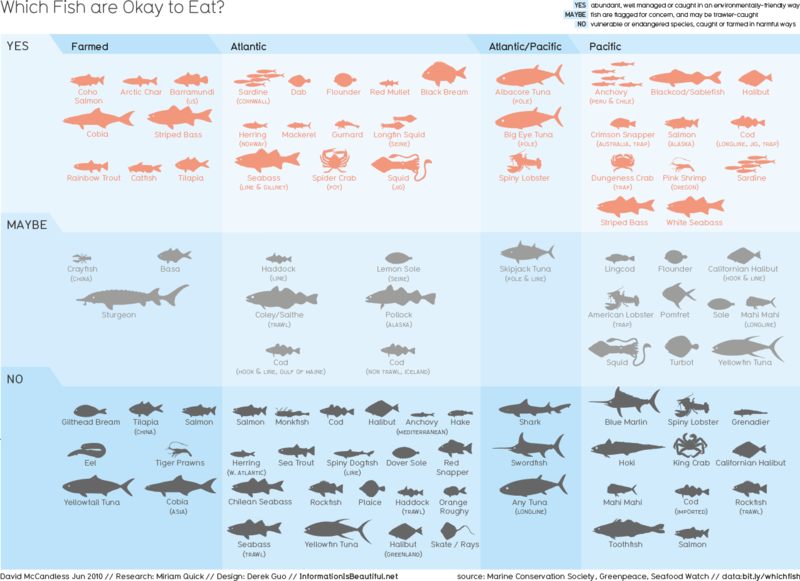 With this in mind the Information is Beautiful team have produced this simple infographic that breaks down the oceans and explains which fish are ok to eat. The data used is from 2013 and the team have also created the same infographic with data from 2010 showing just how much the guidelines change.